Hello everyone! We’ll start today a series of posts to go deep into interesting facts and details of Dream Chamber. 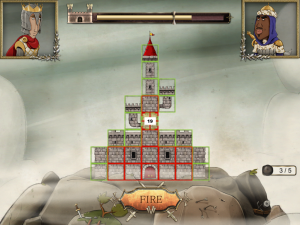 We hope you’ll appreciate more our game and it’s intriguing story. 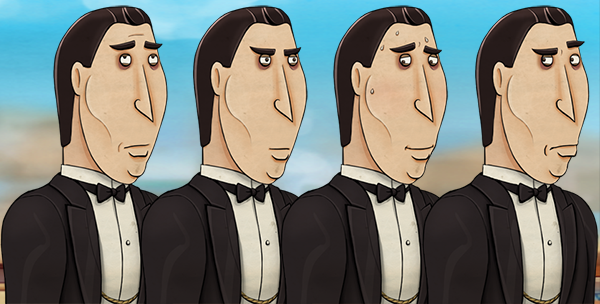 Let’s give first space to the characters, today we talk about Gregory Gale, the faithful butler of Charlie. No one knows anything about his past, but Gregory serves Charlie by over 10 years , offering his services as a personal secretary and as handyman . His knowledge of the bureaucracy and of law in general let us to hypothesize studies in that field , even if we do not know. Although he has this dark past, since it was presented by the Thrademarkus family to Chamber family , he has always stood out to perform the tasks efficiently . The relationship that binds him to Charlie is very deep , and it is so ingrained that Gregory consider the eccentric billionaire as his only friend . Indeed, Charlie couldn’t do anything without his butler, who performs all the practical matters and completes what he doesn’t finish . Don’t be confused by its look a little strange , the saying ” looks can be deceiving ” could not be more true. Behind a physical shape accentuated ( on tonnage and height) , and a silent appearance, is hided a sober and quiet man , always ready to satisfy his own boss efficiently . And you? How did you felt about Gregory? He was been useful in the resolution of the case? Having a loyal butler at your side can be useful … just to have someone to talk to in the car, right? With this post, we want to introduce one of the most important features of Dream Chamber: the “interrogation-battle” – a little “game” that significantly affects the ending of story. In fact, Dream Chamber has two different endings, so keep playing it … and remember: if you want to defeat the “White Widow” during the final “interrogation-battle”, you’ll have to discover how to collect the biggest number of in-game clues. 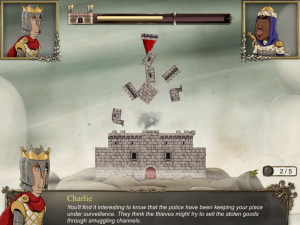 Some critics have understood that, during the “interrogation-battle”, players should decide WHAT Charlie will have to say; since all the alternative sentences have exactly the same meaning, they have complained that the mini-game are meaningless. But, actually, players will just have to decide HOW Charlie will say sentences. Ok, fine, you have caught us: the real reason of this post is to reply to those reviewers that haven’t understood the logic behind the “interrogation-battle”. And yes, this is our fault: we hadn’t explained it enough … but, we are writing this post and, most important, we have already submitted to iTunes and other stores a new update of Dream Chamber that, besides the autosave feature, adds a “mood icon” next to the sentences that Charlie can say. 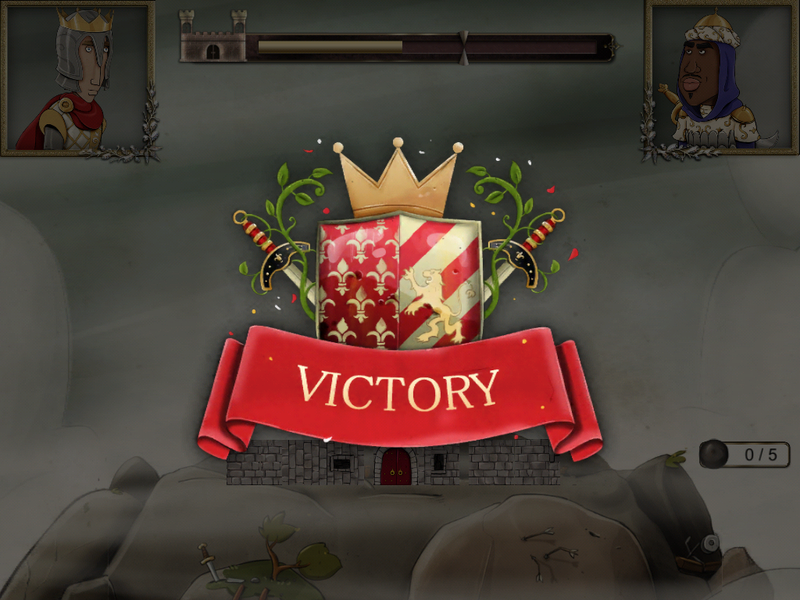 Let’s start from the beginning: how the “interrogation-battle” minigame is introduced into the game. As Charlie himself admits, he has big problem to stay focused, because he gets bored really easily. So, to prevent his lack of attention, he imagines himself as a warlord that has to conquer the opponent castle; if he succeeds in conquering the castle, striking Castle’s weak points, he will obtain the information he needs. Even if it could seem strange, actually it is very coherent with the dreaming symbolic image often used in Dream Chamber: the castle symbolizes the strength of will of the interrogated suspect and Charlie’s questions are cannonballs which literally “destroy” the interlocutor’s defenses. 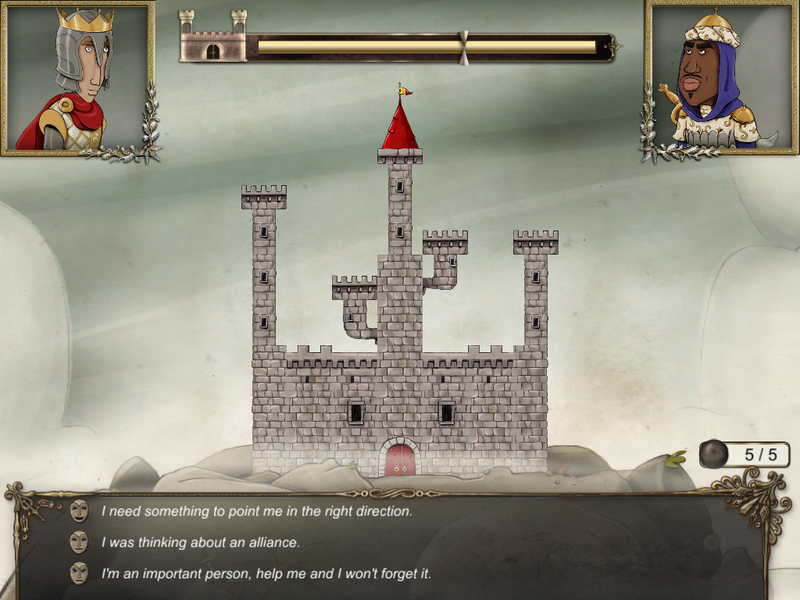 Let’s go on with the symbolic meaning of the “interrogation-battle” minigame: each in-game character has a castle of different shape, this symbolizes his reasons, which may be more or less solid; each castle has different weak points and player has to decide which one to strike with the cannonball, it represents the ability to choose the right argument during the interrogation; cannonball power is linked to the choice of the right tone of voice, because in real life often doesn’t matter what you say, but how you say it, in response to your interlocutor’s attitude. Determined/Aggressive: Charlie tries to seem very confident, sometimes bluffing or threatening. …to make blow up your interlocutor’s defences! Ok, everything is very clear now, but how are players supposed to choose the right Charlie’s attitude? Analyzing the events, mainly the previously collected information and the opponent’s attitude … in the end, do players have to perform as private detective, acting like him, or not?? Remember that, as in the real world, sometimes you can think to have won a battle, but maybe you haven’t realized that you haven’t collected all the information; alternatively, other times, you cannot win a battle, because you don’t have the right information (and so, the right answers). This is very important to achieve the second Dream Chamber’s ending. Comment and follow us on Official Dream Chamber Fanpage , where you can find news about Dream Chamber. Today, Germano Brugnoni (Ger) explains the strange “Noir” setting of the game and the “Antihero” Charlie! Hi Guys, I’m Ger, the Author and the Game Designer of Dream Chamber. Nice to meet you all! Well, the Noir setting … Let’s start from the beginning. Our main idea was to create an adventure game that was even an artistic entertainment product, suitable for genre’s fans and new players too. The product should have been funny, plesant, but not comic. So, we started to re-invent the Noir genre, introducing all its tòpoi and cliché, but exacerbating or overturning them too; everything to achieve our purpose: to create a product that wants to be ironic and really original, almost a noir “parody”, able to give to the users some carefree hours. By the way, our will to create a funny, plesant entertainment product, lead us to the choice of avoiding a too hard gameplay difficulty, removing all the gameplay aspects that in adventure games normally lead the users to get stuck! So, we can see Dream Chamber is a funny, ironic, interesting interactive story, with an engaging storyline that always keeps your attention at every turn. In Dream Chamber we have a lot of Noir cliché – as someone said, we have femme fatales, Bogart-style fedoras and even a character named Chandler -, but we have completely overturned the most distinctive element of the noir genre: the protagonist’s features. Usually, the main character of noir stories is extremely coherent, upright, never settle for compromise; rude and crusty, but somehow captivating. Charlie, Dream Chamber’s main character is, in many aspects, exactly the opposite: he is very very rich (trait almost completely absent in noir protagonists), disinterested in everything, he doesn’t follow any ideal and doesn’t care justice. He doesn’t know what is “honor”, he is simply naïvely good, very rich and bored. Unlike a typical noir detective, Charlie doesn’t know anything “about life”, he is completely alienated from reality and he hasn’t got any experiences to support him; for sure, he isn’t respected and he hasn’t got any charisma. All that is often highlighted, from his presentation, where is well highlighted that Charlie doesn’t work because he has to, but beacause he is bored. So, even when he is awake, Charlie lives in his world, dreamy, naive that makes him seem almost a little bit stupid. Ironically, playing with the dream game mechanics, Charlie is more awake when he is sleeping: during his dream, he can talk to Charles, the representation of his ego, that lead him to reality. We tried to transpose the Charlie’s vision of world in the graphic style: Dream Chamber world is colorful and cheerful, but at the same time everything is deformed, misrepresent; colors and lines are soft, pale. This graphics style fits perfectly with the noir-dreamlike atmosphere that we looked for!